A$ Prices are on this website, alternatively, please contact us for prices and availability on any of the Crosstex range of products. 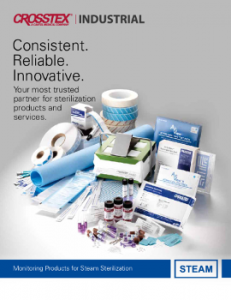 Crosstex Industrial offers a wide range of industrial sterilisation monitoring products used by pharmaceutical and medical device manufacturers, contract sterilisers, laboratories, and biotech companies. 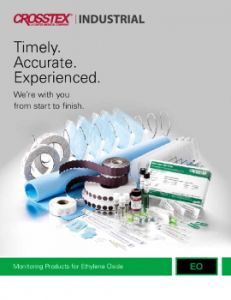 All Crosstex Industrial products require only minimal training to use and are manufactured in ISO 13485 certified facilities. Chemical Process Indicators (CPI’s) for sterilisation processes which use steam, irradiation (gamma radiation and E-beam), ethylene oxide (EO), vaporised hydrogen peroxide (VHP), formaldehyde and dry heat/depyrogenation. 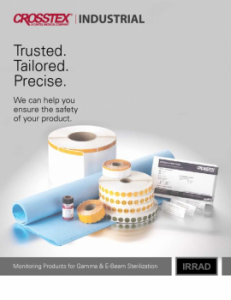 For those who prefer to use adhesive indicator tape, Crosstex now offers Indicator Tapes for steam, ethylene oxide (EO) and vaporised hydrogen peroxide (VHP). 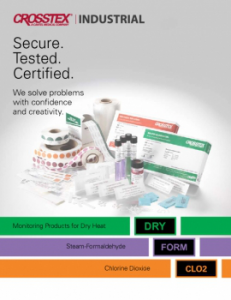 Chemical Indicator, Integrator and Emulator Strips: These are now available for sterilisation processes which use steam, ethylene oxide (EO), vaporised hydrogen peroxide (VHP), formaldehyde and dry heat. Biological Indicators (BI’s) are available in a variety of formats including Spore Strips, Spore Discs and Spore Threads. 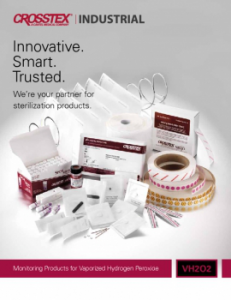 Crosstex Industrial have a range of stainless steel coupons, discs and wires inoculated with spores. Crosstex BI’s are are available for use with steam, irradiation (gamma radiation and E-beam), ethylene oxide (EO), vaporised hydrogen peroxide (VHP), formaldehyde, dry heat and chlorine dioxide sterilisation processes. Self Contained Biological Indicators (SCBI’s): SCBI’s offer convenience of use and are available for use with steam, ethylene oxide (EO) and vapourised hydrogen peroxide (VHP) sterilisation processes. Perhaps you need a custom product, then contact us to find out how Crosstex Industrial can can help you.